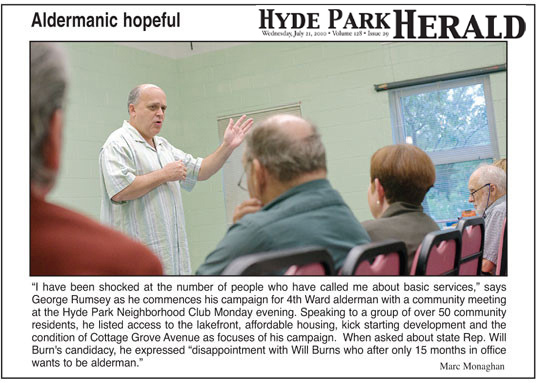 Former Hyde Park-Kenwood Community Conference (HP-K CC) head George Rumsey told the Herald this weekend that he will challenge state Rep. Will Burns (D-26) for the position of 4th Ward alderman in the upcoming election. Burns was hand-picked by current Ald. Toni Preckwinkle (4th) as her successor. She was very gracious about it. She actually said she would not tell me not to if I wanted to [run],” Rumsey said. No other candidates have officially announced a run for the position. Rumsey enters the race with an emphasis on the political decision-making process, a topic of great interest to many Hyde Parkers. Having overseen a number of public development discussions — including the closure of the Hyde Park Co-Op and development of Harper Court — Rumsey is known publicly as a conciliator, a man who brings different points of view together in the hopes of finding common ground. 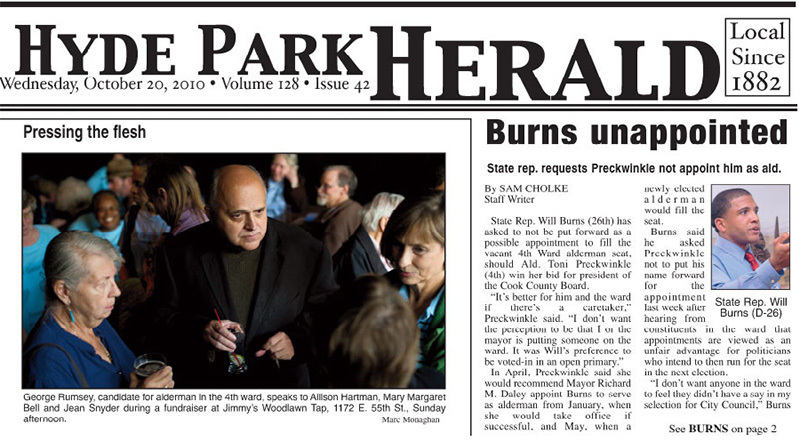 The aldermanic position, he said, is a position where he could continue that tradition — valued by many Hyde Parkers. “Development should begin with community input and end with community input,” Rumsey said. He points to the process by which Harper Court is being redeveloped as a missed opportunity. “I think the whole Harper Court process is a glaring example of what I would have done quite differently. I’m glad we’re getting somewhere with Harper Court, but I think how we got there is not how it should be done,” Rumsey said. Rumsey is critical of Preckwinkle’s relationship with developers. He thinks the gaping holes on 53rd Street created by developers who made promises and never fulfilled them should, to an extent, be the responsibility of the alderman. 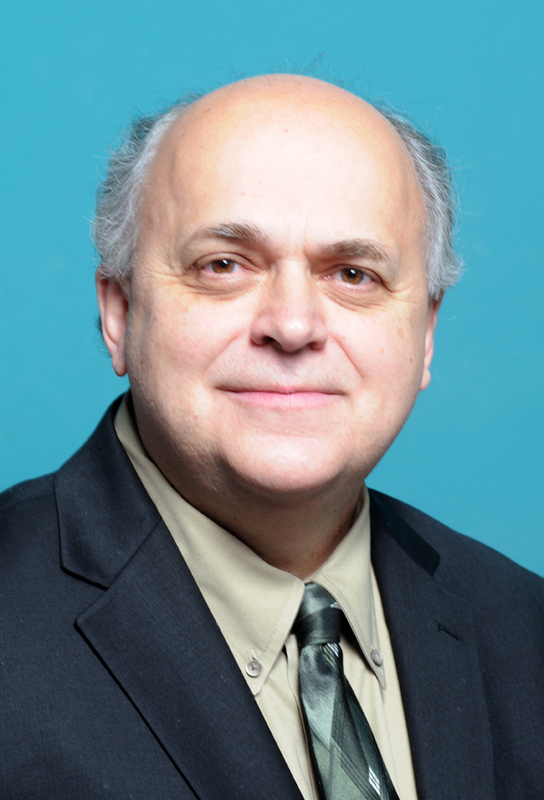 Rumsey, 56, in addition to being the former head of HP-K CC, is a founding member and vice president of the Coalition for Equitable Development, an affordable housing group, and the Computer Resource Center, a business that teaches employees of not-for-profit organizations and others computer skills. 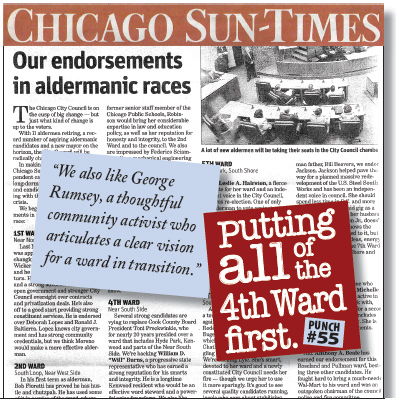 Rumsey is planning a “meet the candidate” event on Monday, July 19 from 7 to 9 p.m. at the Hyde Park Neighborhood Club, 5480 S. Kenwood Ave. For more information, visit georgerumsey.com.